That's the problem. Nobody knows how to prevent it. There isn't an anti-gun law, social program, or tracking system that can stop every lunatic from finding a way to hurt people. Well, maybe one but they've banned God from schools. The FBI and Florida officials had plenty of warnings sufficient to place a "medical hold" on Nikolas Cruz. He is suffering from schizoid paranoia. Because of incompetence of the government at several levels, young people needlessly died. The solution is NOT to put more constraints on the 99.9% of the citizen militia but simply enforce the laws already on the books. Major Nidal Hasan is another case in point. Officials at Fort Hood knew of disturbing information about him before the massacre but feared to act because of over sensitivity to moslem affirmative action. There are scores of other tragedies that could have been intercepted but the turmoil in politics has prevented straightforward measures to be put in place. One of the victims used to be in my stake. Never met the family, but saw them at many things. So upsetting the FBI didn't follow through. As long as we keep our schools as free fire zones, yes, it will continue. If some lunatic wants to shoot up a school they will. No gun ban will stop that. No guns in the school will stop that either. There are school shootings going back a century in many many countries. The fact remains that most attacks are on defenseless schools and day-care centers. Only rarely are well-defended sites attacked. Most of the attackers are cowards. Any free-fire zone is an open invitation to attack. Probably true. If we are talking about opportunist attacks (terrorists and the like). Just as many are revenge attacks against a specific target. Not so sure that arming the target of revenge will always deter the lunatics. Didn't stop Reagan from getting shot. He was surrounded by good guys with guns. I will admit that if a crazy person really wants to shoot someone it is almost impossible to prevent......just like crazies shooting up schools. What are your suggestions to preventing more of these situations? Oh, don't give me that. Seriously, how exactly do we prevent these things? What law would have prevented these recent tragedies from happening? 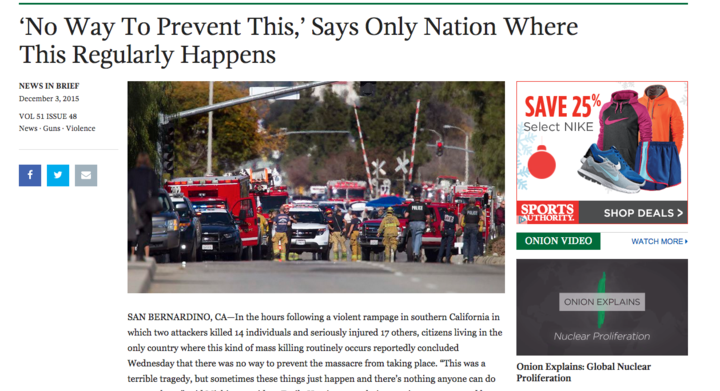 Nor is this the "only nation" where this happens. This is the only nation where this regularly happens. The solution is simple and obvious. Outside of war zones, yes it is. The compromise is to have locked facilities, so that one must identify oneself before entry, and carrying an AR-15 or AK-47 would be a dead giveaway that somebody was up to no good. I have actually seen schools adopt more secure systems. Armed security may also be necessary, as it is on all college campuses today. When I was a boy growing up you saw daily multiple shotguns and/or rifles hanging the in the back window of trucks. Coincidentally, there was never any shootings at schools. Something has changed and it is not the prevalence of guns. Gun ownership in the US has actually gone down since I was a boy. It is easy to point at guns - a thing individuals can use to harm other people - as the terrible culprit. The problem with that quick accusation is that a gun can do nothing by itself - it is a thing that requires a human to abuse it. I don't have a problem with Gray's suggestion that some weapons be made illegal - we already have some of those laws now. Expanding them to include additional weapons, an AR15 for example, is not a bad idea. I can support such a restriction. A more immediate response to the recent mass murder is simply implementing the laws we have on the books. Police enforcement agencies need to have a better system of responding to valid tips. Those who suffer from certain psychological problems should not be allowed to purchase any weapons may be something to look at also. However, there is something wrong with a citizenry that produces individuals who want to kill people en masse. We need to understand the real problem and heal that problem in order to obtain a long-term cure to this societal malady.